I recently was invited to keynote the Ragan New PR and Social Media conference in Chicago where I met some truly amazing people doing some truly incredible things in the world of enriched communications. Following my presentation, I was asked to share my thoughts for identifying influencers and also the associated methodologies and strategies that serve as the governance for meaningful communications also known as the rules of engagement. Also, I should point out that my use of the word “audience/s” has adapted over time. 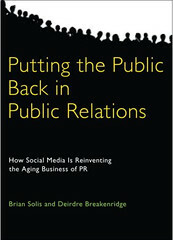 In our book, “Putting the Public Back in Public Relations,” Deirdre Breakenridge and I propose the elimination of the word from our marketing vocabulary. We realized it was more effective to adapt its definition rather than replace it as many are still wrestling with this concept and its preventing frictionless evolution. What we’re truly professing is the need to view the people, the individuals, who comprise the audience and realize that in this personal process of visualization that there is technically no “one” audience nor is there only one “message” that fits all. What we’re referring to is the notion of connecting directly or indirectly with public or publics. Our initial mission was to remind PR practitioners that we are working with people and not broadcast beacons, which fundamentally changes the dynamics of how we operate – from what we say, how, and to whom. The industry took a very disconnected detour over the decades by interchanging public relations with publicity, visibility versus presence, and substituting people with outlets. In the social web, we’re also observing relations and relationships and the direct and indirect exchanges between friends, followers, connections in and around social graphs. In many cases, “relations” satisfies the level of engagement as dictated by those with whom we collaborate. In Social Media, relations is scalable whereas cultivating “relationships” is reserved for the groups of people who require deeper interaction, now and over time. It isn’t designed to be a mass marketing ingredient, but a focused effort in which we collaborate and invest in the alliances that benefit through the interrelation. Social Media is redefining relationships and in many cases, extending the realm of conversations. RTs, Likes, for example, aren’t necessarily conversations nor are they acts of furthering relationships, but they are a form of relations and they are meaningful. In order to effectively engage today, we need to first identify the people of significance and determine our role within the various ecosystems of value. You’ll quickly observe that in the [lack of] attention economy, relations and recognition, and not necessarily relationships, serve as the primary currency of Public Relations, Customer Service, and Marketing Communications. Kindle users, subscribe to PR 2.0 here to receive this feed on your device. Stowe and I have been batting this one back and forth this morning. There's an issue of semantics here, but if I may split hairs, whether one prefers audiences or publics, I do think there's a distinction to be made in how we address ourselves to the audience/public, or not. In social situations, we address ourselves to others. But in social media we may often simply “speak,” not to anyone audience/public in particular, but with the awareness that we're being heard by an audience/public. I think of this as a difference between actively or passively engaging an audience/public, and I tend to view the audience as those we actively address ourselves to, and public as the community we have a passive awareness of. danah boyd has a concept of invisible audiences, by which I think she means this implicit awareness of others that can affect how we behave but which isn't close by. I think the concept of visibility is useful, insofar as the attention economy is governed by the fact that we not only see others, but see ourselves being seen. So this awareness of a public that sees us is, to me, different from the audience we address ourselves to. The distinction translates nicely in the example of following vs followers, those we follow being “in front of us” and followers being “behind us.” Seeing vs being seen. Adrian, this is a bigger discussion I will address at a later date, but I don't necessarily agree or disagree. I enjoy your thoughts and the path your traveling. In this case, it is getting to the level where we may be missing why it is we participate in social media in the first place. This is why I call it Social “ME”deia and not the Social “WE”b – although, we're working our way towards putting the we in web. The point is that we [should] engage at varying levels with different groups of people based on the discussions that define or invite opportunities for participation (as vocalized) by the aspirations, desires, and needs of each. They are people tied contextually that extend a virtual hand (intentionally or unintentionally) that offers an introduction rooted in relevance in a forum where we are the guest, not the host. The attention dashboard, which is both the mirror and looking glass into the attention economy, is not about us seeing others as much as it is about us seeing ourselves in the content that flies through it. Those “few” updates that actually resonate with us, trigger a response mechanism that shifts from broadcaster to consumer, which allows us to see and feel what was just shared (including the people behind the information). Viewing anyone as in front or behind us changes the dynamics for engagement – I believe it's circular and transforms based on the dialogue at hand. We are not followers nor following individuals for everything in which the stand or represent. Right on brian. Changing language, and our metaphors in particular, is so important to shifting paradigms. It's one reason i use the term “talk technologies,” to emphasize the social dynamics of talk. And moving from a specular metaphor to talk also permits us to recognize the importance of time, which is often the hidden dimension in attention economics. Conversational strategies unfold over time and have runs, turns, sequences, series, and dynamics. As you point out, so many of the network-based concepts miss out on the interaction dynamics of participation, be it active or passive.